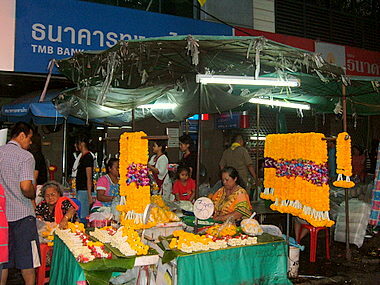 In Loy Krathong 2007 we take a look at yet another two areas in Bangkok where the festival was celebrated. 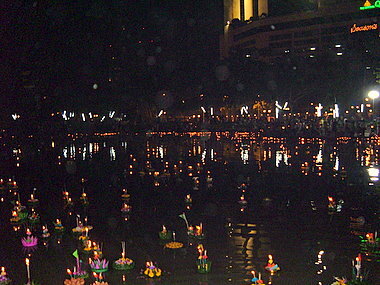 As part of the nation-wide celebration of Loy Krathong in Thailand, the Royal Thai Navy organized a lighted floats procession along Chao Phraya River from Taksin Bridge to Krung Thon Bridge from 21 – 24 November 2007. These lighted floats along the Chao Phraya are an annual feature for the Loy Krathong Festival. 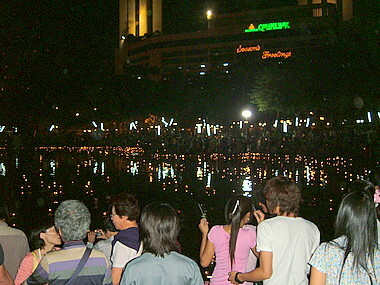 The actual Loy Krathong day is on 24 November 2007, the night of the full moon on the 12th lunar month. 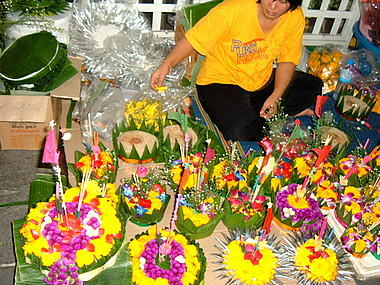 For the cultural background to the festival, please see Loy Krathong Festival. 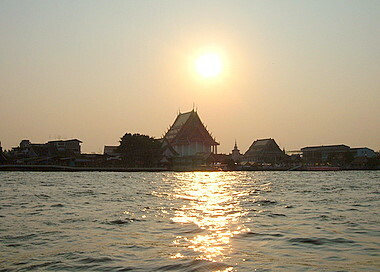 Our first stop is at a royal temple on the Thonburi bank of the Chao Phraya near the mouth of Bangkok Yai Canal. This temple was built in 1765 on land donated by a nobleman, Chao Phraya Nikornbodin and later presented to King Rama III who gave the temple its name, Wat Kanlayanamit. Wat Kanlayanamit is in the Kudi Jeen riverside community where the old Portuguese Santa Cruz Church is located. 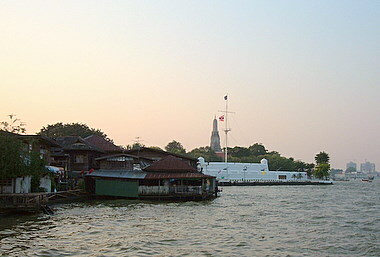 Fort Vichai Prasit and Wat Arun are just across the canal. I couldn’t help smiling as I walked through the temple fair on the grounds of a 240 year old temple celebrating a festival originating from 13th century Sukhothai to the beat of catchy bubble gum music of the 1960s. It was early evening and the crowd was thin made up mostly of school girls in traditional Thai dresses or Girl Guide uniforms strolling through the fair. Others waited patiently at the temple pier for twilight to float off their krathongs. 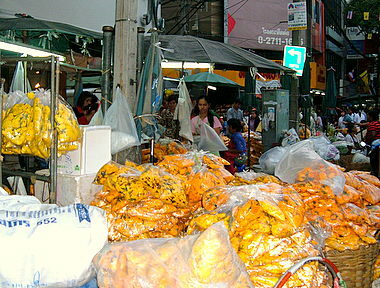 Back on the Bangkok bank of the Chao Phraya, flower vendors at Pak Klong market were doing a roaring trade as shoppers packed off with sacks of flowers and krathong material for their private loy krathong parties or for resale as krathongs. Our next stop in Loy Krathong 2007 was Benchasiri Park in Sukhumvit Road near the Phrom Phong skytrain station and the Emporium mall which was all decked up for Christmas. 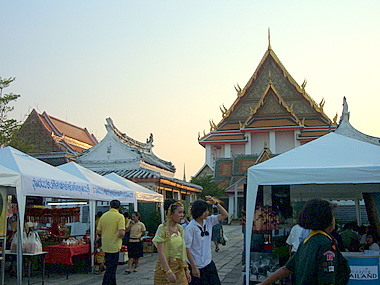 Crowds thronged the gates to the park inching their way in as the passage was blocked by krathong vendors. Those coming out from the park had an equally hard time. I went around to the gate at the other end and managed to find a way in. The scene in the park was a joy to behold. 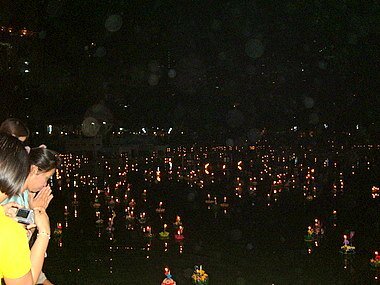 By 9:00 pm the lake was filled with lighted krathongs glittering in the dark waters with the bright lights of Sukhumvit in the background. The crowd here was more cosmopolitan as the Sukhumvit is home to a large expatriate community and also attracts a lot of foreign visitors. It was heartening to see people of different nations mingling among Thais from all walks of life around the lake as they floated off their krathongs. 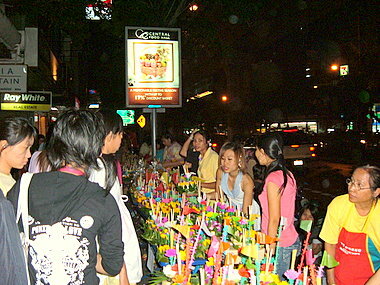 Adding to the color of the occasion were the krathong vendors in Sukhumvit Road lining the sidewalks and hawking their wares to people on the way to the park. Here was a chance for a closer look at the colorful krathongs. Loy Krathong 2007 featured the festival from two different parts of Bangkok; an old riverside community by the Chao Phraya and a middle class area in the city center, two very different sides of Bangkok bound by a common culture. 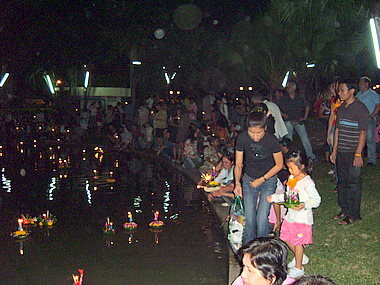 For details of last year’s festival, please see Loy Krathong Festival 2006. 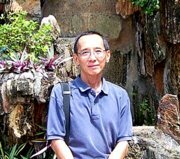 Explore Bangkok on your own with Tour Bangkok Legacies – the e-book my Smashwords edition of an-e-guide book for the independent traveller.